After our 51st day of temperatures over 100 degrees here where I live, you’d think that all I’d be drinking would be iced tea. Not so! Walk into any building around here and the air-conditioning is running full blast. It’s like a Scandinavian sauna experience in reverse all day. First you freeze your tush off in the air-conditioned indoors, then you walk outside into the blessed warmth and finally take a seat in your sauna-like car. To complete the experience simply run back indoors into the chill – it’s like plunging into a frozen lake. So yes, it may seem strange to review a lovely spiced hot tea – one that might be better suited for sipping around a roaring fire and served by Sven The Alpine Ski Instructor (or Svetlana, depending on your preferences) – in the dog days of summer but hey, it’s freakin’ freezing in here! 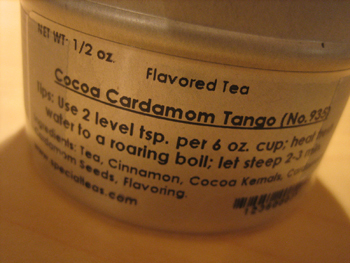 Full-leaf black tea with a decadent blend of cocoa bits, cardamom pods and cinnamon. Smooth and delicious. I followed the recommendations for brewing, pouring fresh boiling water over 3 heaping teaspoons in my 3 cup teapot and letting it steep for 2 and a half minutes. 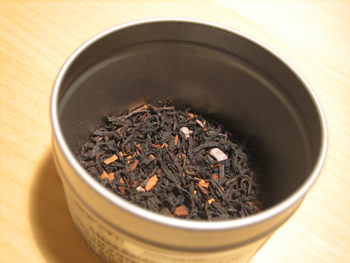 The resulting tea had a lovely smooth and medium-to-full bodied feel with absolutely no bitterness at all. The spices added a sort of “warming” feel it it all and oh-my-gosh it smells heavenly. It tasted a bit like drinking a gingerbread cookie. I tried this one with milk too but I think it does fine on its own. In fact, I think it’s better without the milk. 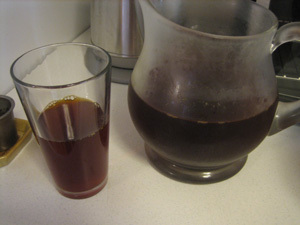 I didn’t try a second brewing with this one but I’d suspect it’d do just fine; the black tea seems to be of good enough quality to stand up to a second brew and the spices are hardy enough to impart their flavor one more time. Making proper Thai iced tea isn’t that hard. But given how long it took me to finally get it right, you’d think it was the most complicated procedure in the world. Maybe it’s just me, but trying to decipher the mystery of the sweet concoction I’d savor at Thai restaurants was challenging and frustrating at first. Every recipe I consulted told me to add sweetened condensed milk to the prepared, cooled ice tea. No matter what I tried, it seemed like I could never get the right ratio of sweetened condensed milk to black tea to make it sweet enough. It never looked right either, with globs and blobs of the syrupy milk floating in my cold tea. 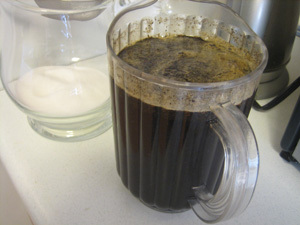 Even thinning out the thick syrup with hot water to create my own milky version of a simple syrup didn’t work. It wasn’t until the local Thai restaurant told me their secret that I finally figured it out. And now I shall share it with all of you (who probably already know all of this, thus making me feel all that much more silly for having taken years to figure this out). No matter. I’m too proud, happy and satisfied to be finally sitting here – in the 150 bazillion degree heat of a Texas summer – with my lovely glass of Thai iced tea to care about that. 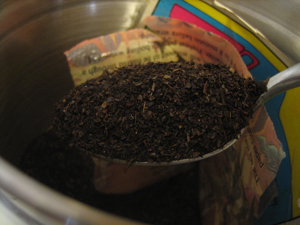 First you need to brew up some strong black tea. 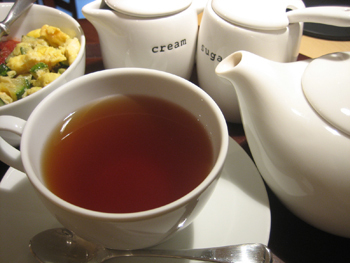 Any black tea will do, but one flavored with star anise is traditional. 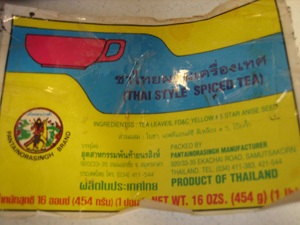 Be warned, if you buy a “thai tea” blend at the store (you can find it easily at any Asian food mart) it may also contain a bit of red or yellow food dye, so be careful not to get any on your clothes or you’ll end up with instant stains. 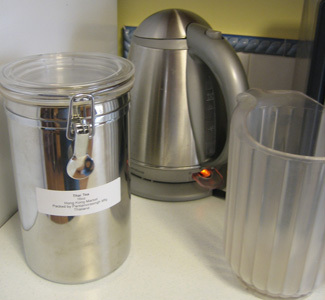 I use about four heaping soup spoons of tea leaves to a full kettle of boiling hot water and pour the hot water directly over the tea leaves, giving it all a quick stir with a spoon before letting it steep – about 5 minutes. 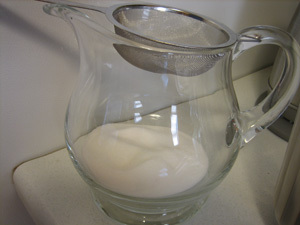 After it’s finished steeping, I pour it through a fine meshed strainer into another pitcher and add about a cup of sugar. Stir this up and put it in the refrigerator to cool down. Yes, it’s REALLY REALLY strong and REALLY REALLY sweet. If you want to have this without the milk, you might add about a third of the same amount of water and then pour it over ice before serving. Or hey, you can drink it straight up and then mow your yard. And the neighbor’s yard. And the side of the highway. And then do something nice and relaxing, like build a house out of toothpicks. 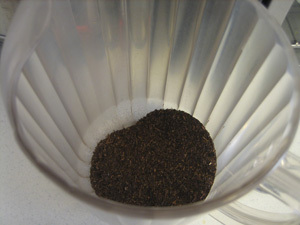 To serve, fill a glass with ice and then pour about two third of it full with the dark tea and the last third with milk. Voila! 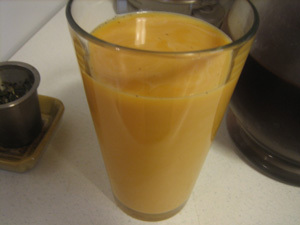 easy-peasy Thai Iced Tea.